The New Amsterdam Market in 2012. The market will only be open for one day during the summer 2013 season. SOUTH STREET SEAPORT — The New Amsterdam Market is bringing its selection of artisanal food vendors back to the Seaport this summer — but only for one day. The popular, outdoor greenmarket, which has set up shop in a parking lot outside the former Fulton Fish Market buildings since 2007, had been running every Sunday from the spring through the late fall for the past two years. But this year, the market will only have its roster of more than 70 merchants selling their local cheeses, meats, breads and various prepared foods on June 23, and possibly select days in the fall, according to a statement from the market. New Amsterdam Market founder Robert LaValva made it clear in March — after City Council Speaker Christine Quinn announced plans to transform one of the abandoned fish market warehouses, known as the Tin Building, into a permanent, local food market — that his host of vendors would no longer make the Seaport their seasonal home. LaValva had long spearheaded a grassroots effort to create a year-round market inside both the landmarked Tin Building and its neighboring former fish market warehouse, the New Market Building. But after the marketplace announcement, which came as the City Council approved the massive redevelopment plan for South Street Seaport’s Pier 17, LaValva told DNAinfo New York that while he was supportive of the plan, it wasn’t the grand marketplace he had envisioned and he didn’t think he’d be involved in the future. LaValva also said he’d start looking for another city spot for his market this spring. He did not immediately respond to a request for comment this week. The market on Sunday will run from 11 a.m. to 5 p.m. Some new additions include Red Hook Winery, Sohha Greek Yogurt, Amagansett Sea Salt and Sip Soups. 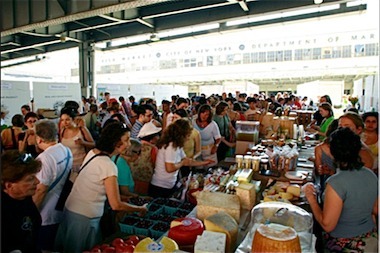 For a full list of vendors, visit New Amsterdam Market’s website.